This unusual and interesting name is of English origin and is a dialectal variant of a so called "lost" village called Hatherell. The derivation of this name is from the Olde English pre 7th Century "hoegporn", hawthorn, and "hyll", hill, thus hawthorn hill. 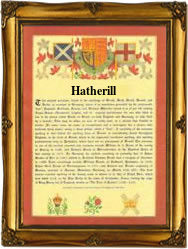 The variants in the modern idiom, include Hatherill, Hatherall, Had(d)rill. The phenomenon of the "lost" village (of which it is estimated that there are between seven and then thousand was a result of the enforce "clearing and dispersal" of the former inhabitants to make way for sheep pasture in the 14th Century as well as the more natural causes such as the Black Death of 1248, and the various Wars. One Henry Haddrell was christened on February 1679 at St. Giles, Cripplegate. The first recorded spelling of the family name is shown to be that of William Hattrell, married Alice Cole, which was dated 30th April 1554, at Histon, London, during the reign of Queen Mary known as "Bloody Mary", 1553 - 1558. Surnames became necessary when governments introduced personal taxation. In England this was known as Poll Tax. Throughout the centuries, surnames in every country have continued to "develop" often leading to astonishing variants of the original spelling.